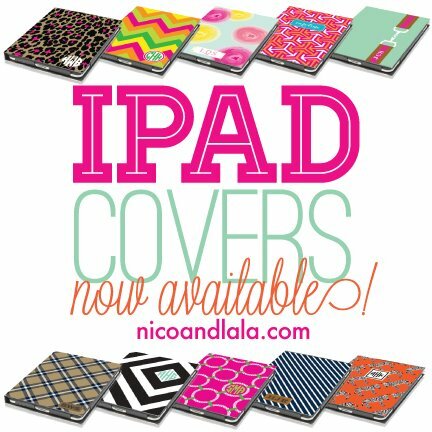 Nico and LaLa: IPAD COVERS ARE HERE! We have so many swanky patterns and colorways to choose from and we could not be more excited about these! Nico and Lala iPad covers are made with environmentally friendly inks and Post Consumer Recycled materials. They are also stain and water resistant, and fold out easel style for easy viewing! These will make such great graduation gifts, a Mothers Day treat for yourself, or just a happy! You can order by clicking here! We can assure you that if your iPad could talk, it would tell you to dress it in something pretty. We hope everyone is having a wonderful Palm Sunday! These look great, I am going to have to share this with my daughter, as I do not even have an ipad but pretty sure that is what she has and she has been looking for a cover of sorts. I would have to say my favorite is the one in the upper right - just under the word happy. So thrilled that these are environmentally friendly too, that is a huge concern for myself, and should be fore everyone. Clever to provide the stand feature as well. Well done, hope you get many sales on this great product for the iPad. A brand new shiny gadget is a beautiful thing. One that's scratched, scuffed, or (gasp!) smashed is not only regrettable, but avoidable. Scottsdale or BUST for a Desert Bachelorette Bash!! An Adorable Golf Birthday Par-TEE! Sweet and Sunny in San Diego!! Twin Birthday Bash: Minnie and Tully turn ONE! !